Last year around this time we were there in UK. My husband came home late from work and said the next day was his colleague's birthday. He tried to get a egg less birthday cake. But his efforts were futile as he didn't get anything from the outlets/shops. I wondered why shops don't sell egg less cake. He asked me to to bake one egg less cake for his colleague. 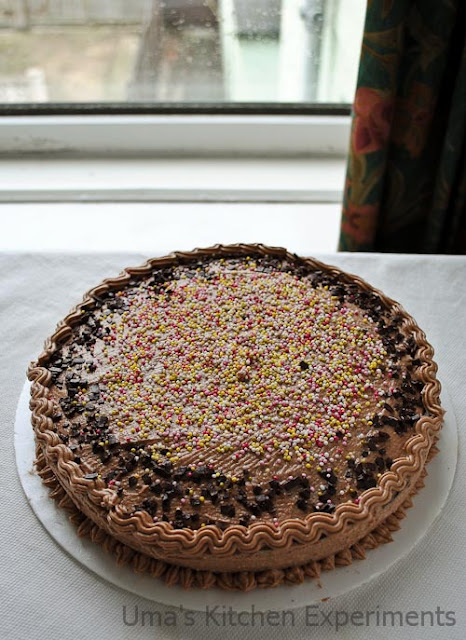 I was a bit hesitant as I am very new to baking and started baking cakes only few weeks before in that year. But I searched few egg less cake recipes on the web and found one beginner kind of recipe from Rak's Kitchen which she adapted from Chow Times. Baked it immediately and did a very simple and quick frosting. Packed it in box and sent it with the husband the next day. Got a good feedback from his office colleagues. 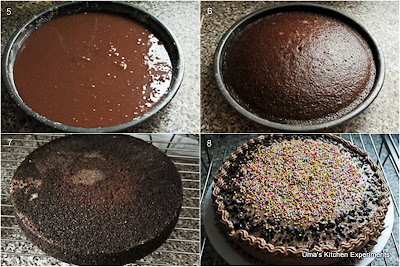 And today, I got this recipe and pictures when I was searching something from my PC. I never thought of posting this recipe in my blog but the pictures reminded me the memories and my wanted to record it. Now I present this recipe. Enjoy!!! 1) Preheat the oven to 180C for 10 minutes. Meanwhile, get all the ingredients ready and grease the pan with butter and then dust it with flour. Keep aside. 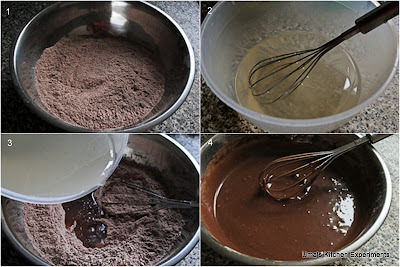 2) Mix all purpose flour, cocoa powder and baking soda together and sift it for 2 times for even mixing. Set aside. 3) Take a mixing bowl and mix water, sugar and salt. Beat till the sugar dissolves. Add lemon juice/vinegar, oil and vanilla essence. Mix well. 4) Add the wet ingredients to the sifted dry ingredients. Mix well. You will get a watery batter as a result of this. 5) Pour this to the prepared baking pan and bake it in the preheated oven for 35-40 minutes. Mine was done in 30 minutes itself. So Keep on eye after 30 minutes. 6) Insert a tooth pin in the centre of the cake. It should come out clean. 7) Remove from the oven and cool down for 10-15 minutes. After 10-15 minutes, transfer the cake to a wire rack and allow it cool completely. 1) Beat butter until it is creamy and foamy. 2) Add icing sugar slowly to the butter. 2) Add vanilla essence and cocoa powder. Beat well again. Add milk if you didn't get the desired consistency. 3) Keep it in the refrigerator along with cake at least for 15 minutes. 4) After 30 minutes, cut the cake into two horizontal slices and apply 1 and 1/2 cups of chocolate frosting and also on the outer surface. Level it using a long knife. 6) Stuff the remaining chocolate frosting to the icing bag and make your favourite design on top of it. 7) Cut into slices and enjoy. 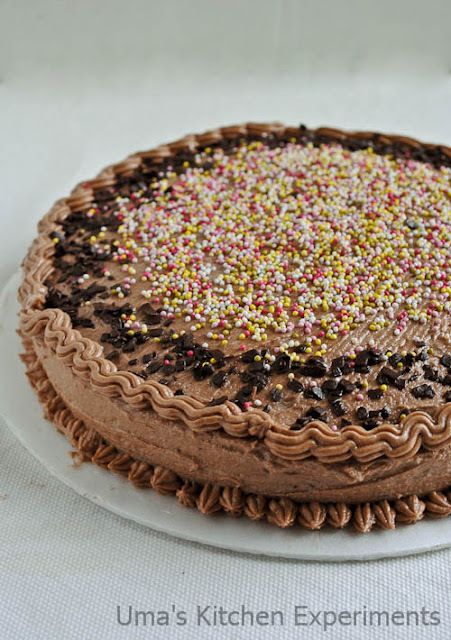 1) Change frosting as per your taste. I prepared frosting with the ingredients available that time in my pantry and made a very simply frosting for the cake as I was very new for both baking and frosting. 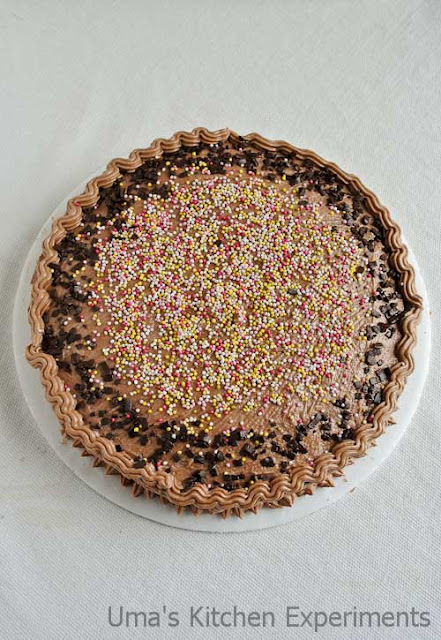 2) Allow the cake to cool completely before applying the frosting. 3) It is not necessary to add the entire milk quantity mentioned here. Add 1 tablespoon at a time and check the consistency. If you don't get the desired consistency, then add the remaining milk. Sometimes, you don't require milk at all. love the frosting you have done uma- looks like a pro work. Looks really nice Uma. Its nice to remember a specific incident from the past and connect a dish to it! Simple and great! 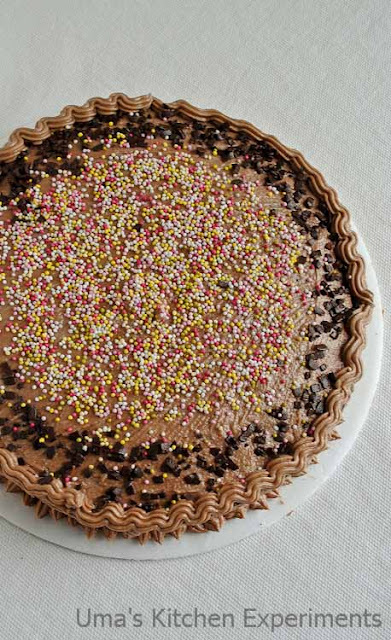 Thats really wonderful to bake a cake for his colleague,beautiful cake.